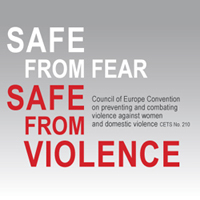 We need all the changes the Istanbul Convention provides. On 7 September 2015 ICchange will be sending Home Secretary Theresa May a motivational mix-tape to tell her ‪#‎ICchangeYourTune – and give her Motivation for Legislation. ICchange is calling on the UK government to do the final bits of legislation needed to ratify the ‘Convention on preventing and combating violence against women and domestic violence’ – known as the Istanbul Convention. On 8 June 2012 the UK government promised to get serious about ending violence against women. They promised the ‘IC’ would dramatically change the lives of all women in the UK. Through this law they promised to prevent violence against women; protect women who are experiencing violence; and prosecute perpetrators of violence. The Istanbul Convention was the first time violence against women has been seen as a whole in law. It sets out minimum standards for action in terms of prevention, protection, prosecution, and services. It means the UK government will have to step up to change laws and invest resources for effectively preventing and combating violence against women and domestic violence. ICchange appreciates the steps the UK government has already taken towards complying with the Istanbul Convention, including legislating on FGM, forced marriage, and psychological abuse, but we need all the changes the Istanbul Convention provides. The hold-up in ratifying the Istanbul Convention – according to the government – is that before ratification they need sort out the law around ‘extra territorial jurisdiction’ and talk to the devolved administrations about their compliance. But the government has become a bit of a broken record – sending out (pretty much) the same line for a year now saying why they’ve stalled. Every day is vital. At least 233 women are raped every day in the UK and on average 2 women are killed every week. So ICchange thought a musical boost might encourage them to finish the work when Parliament comes back from its summer break. ICchange is a group of volunteers campaigning for the UK government to ratify this vital piece of legislation. Campaigning to ensure that all of the changes in the Istanbul Convention are made a reality and to ensure that each individual who has experienced violence gets the support they need. And to end these appalling levels of violence. Ending violence against women must be and remain a priority in the UK. And we need change now. If you want to find out more or need ideas about which songs, look at our motivational playlist. You can join our thunderclap today. And you can sign the petition calling on the UK government to ratify the Istanbul Convention.